Newsweek magazine reported on what it called the new wave of mountain men. It's estimated that there are some sixty thousand serious mountain climbers in the U.S. But in the upper echelon of serious climbers is a small elite group knows as "hard men." 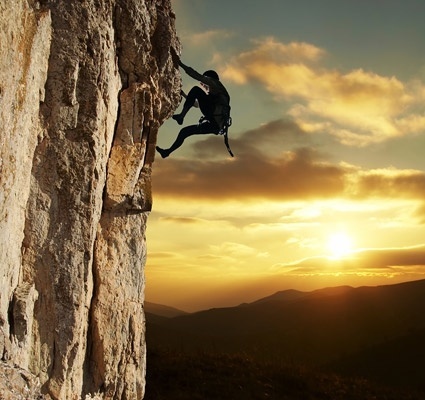 For them climbing mountains and scaling sheer rock faces is a way of life. In many cases, climbing is a part of their whole commitment to life. And their ultimate experience is called free soloing: climbing with no equipment and no safety ropes. John Baker is considered by many to be the best of the hard men. He has free-soloed some of the most difficult rock faces in the U.S. with no safety rope and no climbing equipment of any kind. His skill has not come easily. It has been acquired through commitment, dedication and training. His wife says she can't believe his dedication. When John isn't climbing, he's often to be found in his California home hanging by his fingertips to strengthen his arms and hands. Just like John has committed his life to be the best mountain climber he can be by working hard at it all the time. We need to commit to being the man or women of God and work at it with all our strength. Dear Lord, we thank You that You are there for each of us. Help us to be committed to be our very best and bring honor to You in all that we do. In the Name of Jesus, Amen.